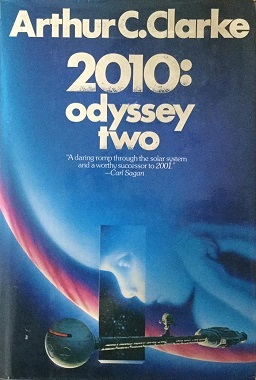 2010: Odyssey Two was a novel by Arthur C. Clarke that was written in 1982. It was made into a movie called 2010: The Year We Make Contact two years later whose subplots differ from that of the novel. Let's discuss some of the technologies and technological milestones achieved between the time of the novel's first edition and now in the real world, and the fictional worlds of the book and film. It was implied that at least one lunar base exisred in the late 90s. The film 2001: A Space Odyssey implies that there were at least an American one as well as a Soviet one. The spaceships travelling to Jupiter are eqipped with nuclear fusion drives. There is a manned spacecraft travelling to Jupiter with a crew of 10+ and rotating sections to generate artificial gravity. People can be hybernated to be awakened when they arrive at their destination. There are highly intelligent computers. Computer keyboards still look like they did in the early 80s in the film. Flatscreens are only used for laptops. which are extremely bulky. All other television and computer displays, even on the Discovery One set are still CRTs. However, in 2001: A Space Odyssey back-projection screens were used, also on the sets of the Discovery One possibly to mimic flat screens! Well I'm yet to actually read any of Arthur C Clarke's works, but I plan to. I was born in the early 90's and so grew up in the 2000's and I loved at primary school finding dusty old books from the 60's with predictions of life by 2000. The books that I read though didn't quite make the predictions of Clarke. Though I reckon we have the potential to do a lot of what was predicted but it simply isn't economical, or we just didn't want to. While I'm not sure we could have men at Jupiter right now even if we wanted to, with the right backing and time I think we could have been on Mars by now and could easily have established bases on the moon. Questions remain as to how safe they would be, but we could be there. Another thing is the video phones, we could make video calls all the time now, but few people actually want to. I use Skype quite a bit but I don't necessarily use the video because then you have to sit there and look at them, or feel like you should be if you don't. Computers though...yeah, no HAL 9000s just yet. Though the old books didn't predict the integration of computers into our lives as much as they have been. I mean they had tiny wrist-watch-phone-computers, but nobody predicted the iPhone! I'd like to take part of what I said back, the Blue Ray of 2001 was on in an electronics store today and they had devices that resembled iPads. The most striking technological prediction I remember from the film version of 2001 was the huge wheel-shaped space station, with artificial gravity. This was the sleeve picture of the album of music from the film, and on posters etc. On the one hand I'm disappointed that we don't have quite such a large and impressive space station in orbit yet. On the other hand, the ISS isn't at all bad! I read yesterday that the first crew of the ISS took up residence in December 2000, ie just a few weeks before 2001, and that the station has been continuously occupied ever since then. So as a permanently inhabited space station came into existence JUST before 2001 started, I think we have to give Arthur C. Clarke some prediction points just for that. After all, he was looking forward more than 30 years. While the Soviet Union already had Salyut space stations in the early 70s, the United States launched the impressive Skylab in the mid 70s. No space station since has had modules of such a vast diameter. Astronauts could run along a circularly arranged rack, giving the impression of artificial gravity, just like the astronaut in the 2001 film, who ran along the rotating section of Discovery One. Thanks for those wonderful clips. I remembered the clip from 2001: A Space Odyssey but I didn't realize that running in artificial gravity had ever been done in real life. I'm delighted to learn that it has. In 2001 A Space Odyssey the crew on the space shuttlecraft can walk around because they have velcro on the soles of their shoes. I read that velcro did become much more widely used because of the publicity from its use in the space program. But has it ben used in that particular way in space? Would that make sense? Or would astronauts rather just float around? From videos I've seen, it is probably a lot quicker to get from A to B on the ISS if you just float. steward147 wrote: It was implied that at least one lunar base exisred in the late 90s. The film 2001: A Space Odyssey implies that there were at least an American one as well as a Soviet one. Yes, I reckon we're a little behind schedule!